The SKX007 models are direct descendants of Seiko’s first dive watches developed in the early 1960′s. 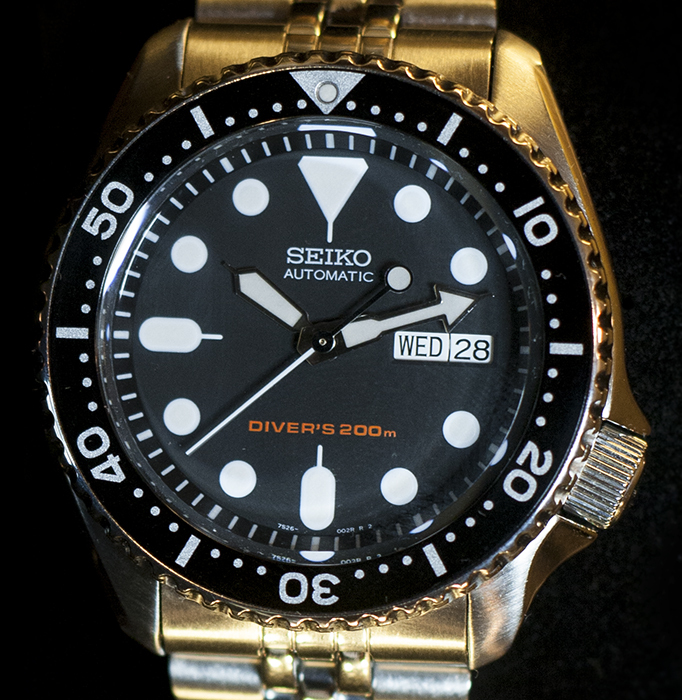 For all of the high end Swiss watches out there, the watch you’re most likely to find on an actual dive boat is the humble Seiko. Designed to be inexpensive but still accurate and reliable, the Seiko SKX series have become an obvious choice for many dive enthusiasts. Seiko offers this line in various configurations, all bearing a resemblance to their predecessors. Because of this self-similarity some people complain that these watches are all too alike and haven’t evolved over the years, but in my opinion they are simply sticking with what works and developing an identity that is distinctly their own. The oversized dial markers and hands, the four-o’clock crown position, the thick and angular bezel and crown guard are all part of the package. 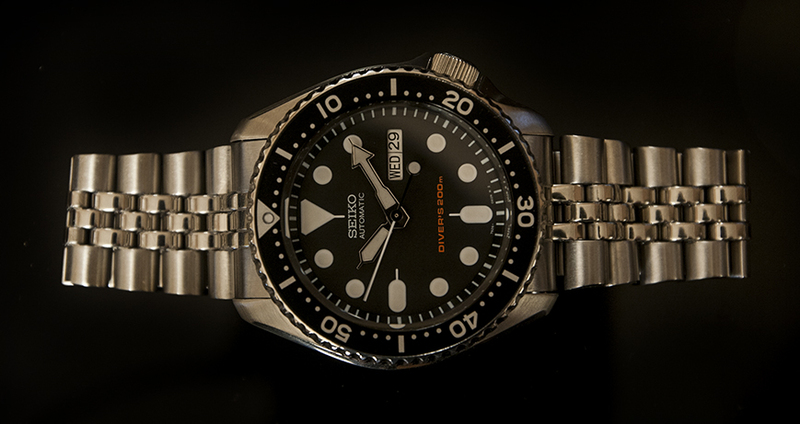 Love it or hate it, the SKX line remains popular amongst divers and is the best selling style for Seiko. All of the opinions below are based on a stock SKX007 that I received for review. The SKX007 has a thick stainless steel case with 22mm lugs. The oversized screw down crown and crown guard are angled to the 4 o’clock position, which makes for a comfortable fit. The 45-degree angle also makes changing the time more comfortable. I feel like I am less likely to accidentally pull any arm hairs out while changing the time, which is always nice. The total height measured from bezel to case back is 13.25mm, which makes the SKX slightly harder to “dress up” and wear under a shirt sleeve. The crystal is completely flat with a chamfered edge and lies slightly countersunk into the bezel. This gives the watch a very square profile. 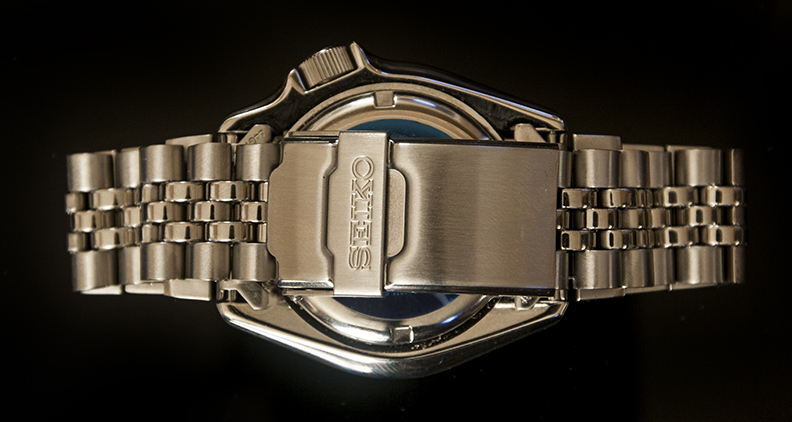 The crystal itself is made from Seiko’s Hardlex material, which should keep it from getting too scratched up. It isn’t sapphire, but it’s probably the next best thing. The unidirectional bezel feels tight and the clicks have a nice sound to them when rotated. The grip on the bezel is decent, though I feel like the teeth could have been less rounded to give a better grip overall. There are 120 clicks in a full rotation. The dial has a very clean and uncluttered look, which is exactly what I like to see in a diver. The oversized hands and makers look great during the day, and when the lights go out, whoa buddy look out! The Lumibright lume glows like the sun and keeps its strength for quite a while. The day/date window is clean and attractive with a nice large font that fits well with the oversized styling of the markers and hands. The day can display in either english or spanish, which is nice, however one detractor is the fact that the date function is a dragging day/date, which means it will begin to rotate at around 11pm and won’t fully snap over until 1am, leaving you in limbo for an hour each day. It is also important to not that you shouldn’t use the day/date quickset during this time, though what actually happens if you do is unclear to me. Seiko uses Lumibright lume, which is some of the brightest and most long lasting lume I’ve ever encountered. The dial markers and hands are generously coated and the lume is evenly distributed all the way to the edge of each marker. There is no border or outline around the markers so the light from the lume is free to spread out in all directions giving a slightly ghosted appearance in the dark. 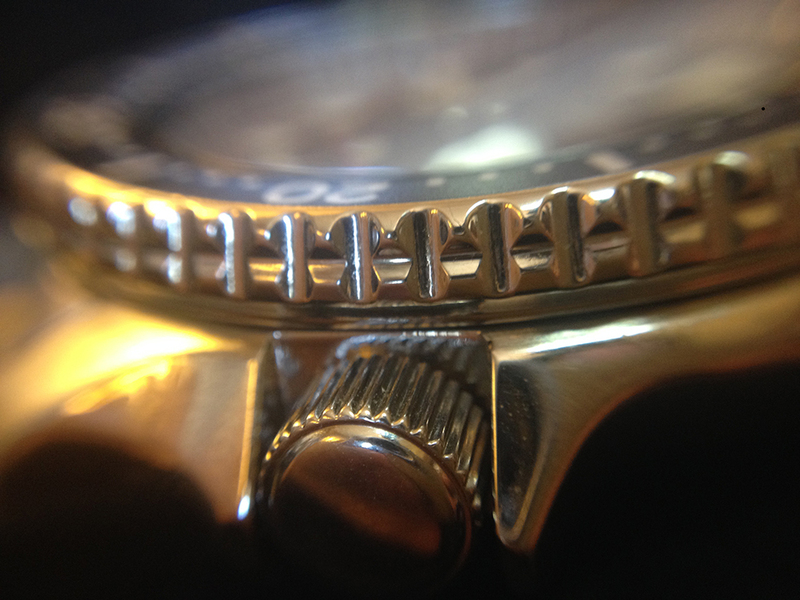 Some people might not like the lack of sharpness, but to me this is something that adds to the character of the watch. The crown has a nice projection and is easy enough to grip, though I would prefer if it were a little more chunky looking. The grooves in the surface are thin and closely spaced, giving the crown a slightly feminine appearance that feels out of place on this beefy tool watch. The K1 version comes with a “Jubilee” style bracelet, which is very flexible and comfortable. It has solid links measuring 22mm at the lugs which taper down to 20mm at the clasp. This is a comfortable bracelet, but like the crown it somehow feels out of place on the heavy 007. The bracelet employs a folding clasp design with a secondary safety clasp. Seiko is known for making reliable movements that can take a beating. The 007 uses the 21 jewel 7s26. The rotor powering the movement is quite smooth and very quiet. I had to hold the watch to my ear to hear it at all. I would imageine this is partly due to the thickness of the case muffling the sounds of the movement, and partly due to well oiled rotor bearings. This movement is not hand wind-able and is non-hacking, which is too bad, but considering the price I’m not complaining. The watch comes in a white box with removable top lid. Inside the 007 is wrapped around a white pillow, though mine had come loose during shipping and was just rattling around in the box. If this were a dress watch I might have been bummed out that my first impression was of a crumpled watch rattling around in a box with a pillow, however since this is a rough-and-tough tool watch that is designed to be beaten up and sunk under the ocean, it was a perfectly acceptable appearance. This is an easy watch to like. It has all of the stylings that you would expect from a diver but somehow still manages to keep it’s personality intact. The SKX007 is available in both Steel Jubilee Bracelet and Rubber Strap flavors for under 200 dollars. Though if you want the best possible SKX007 experience I would swap out the stock bracelet for the amazingly comfortable 22mm Super Oyster Bracelet . This is 50 dollars well spent. I hope you found this Seiko SKX007 review helpful! Did I leave something out? Have something to add? Let me know in the comments. Seiko SKX007 is very good ! > ocean, it was a perfectly acceptable appearance. Perhaps Seiko could add some mud and crushed seashells and improve the appearance even further.